The act of starting business blog is not enough. Successful blogging requires a strategy that includes frequent blog posting in order to capture search and referral traffic. A follow-up study shows that the mere act of blogging does not guarantee more site traffic. Anyone can set up a blog and leave it idle as initial excitements fade. Businesses that actively manage their blogs, however, fare much better than those without blogs. A study of 2,168 HubSpot customers shows that businesses that published at least 5 blog articles in the last 7 days draw 6.9 times more organic search traffic and 1.12 times more referral traffic than those who don’t blog at all. 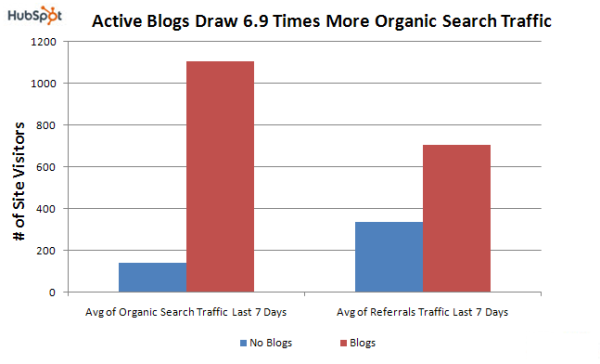 The chart conveys a clear message — active blogs are associated with and likely have an impact on site traffic. This finding coincides with common sense: out of large chunks of business-relevant content (1 post per weekday), blog readers will likely find something engaging and proceed to learn more about a company. A common pitfall for business blogs and really for most blogs is to let the blog fall out of grace before it can reach its full potential. Business leaders will often plan a great strategy for a company blog. They setup the writers for the blog. They commit to writing frequent posts only to later be discouraged by early traffic results. Soon the posts become less frequent and eventually the blog is abandoned after a month or so. Blame for the unsuccessful business blog is usually not attributed to anything other than the feeling that “blogging isn’t for us”. And this may very well be the case. But with only a month or so of effort it’s difficult to know if a blog is actually something your company can benefit from. In my experience, frequency is one of the top three or five factors that determines if a blog will be successful. Having a compelling and interesting blogger voice is probably the most important. Taking on a topic that is relevant and interesting is probably second most important and posting frequently is – in my opinion – third most important. So how does your business apply these top three ingredients for a successful blog? The best case scenario would be to find someone within your business that knows the industry, knows about keyword research, and that has a compelling voice that will attract readers. If your don’t have the resources for this commitment going outside of your company and bringing in an experienced blogger that knows your industry is another option. Blogging frequency is one of the most important factors for a successful blog. As you can see from the study above, active business blogs receive 6.9 times as much traffic than businesses that do not blog at all. This traffic leads to interested customers and potential leads for sales. A common pitfall for bloggers is losing interest before a blog has a chance to establish authority with search engines. As interest is lost with a company blog the frequency of the posts slows down and the blog never gets its chance to be established with search engines. Ways to avoid the pitfall of blogging frequency include setting the correct expectations during the planning stage of the blog. Also, knowing the ultimate goal of getting qualified traffic can be a powerful reminder to keep blog writers motivated to continue posting frequently and consistently. Be sure to share any leads that come through the blog with your writers.